As a little girl, I can remember one of my class teachers reading us the stories of Paddington bear. Although the book she read from only had a handful of illustrations we knew all about Paddington’s red hat blue duffel coat. With her describing the little bear from deepest, darkest Peru. The Paddington movies in recent years have reignited my fondness for the little brown bear. With the children loving the films which are full of fun, adventure and lots of giggles! Please Look After This Bear… Thank You. The Paddington Movie Soft Toy measures 22 cm so is perfectly sized for carrying around on adventures. The soft plush style bear makes him flexible and easy for small hands to hold. Paddington is wearing his blue duffel coat; with toggle detailing and his red bush hat. As Piglet awoke from her nap and found Paddington sitting next to her beloved Paddington Trunki she was so excited. Over the last few days, Paddington has been treated to a few new adventures. From riding around the house on board the Trunki, snuggles in bed during naptime, almost ending up in the bath (a quick rescue mission was needed here!). As well as a trip to Pizza Hut celebrate Mother’s Day. So that you can enjoy some Marmalade filled adventures, Boo Roo and Tigger Too are lucky enough to have a Paddington Movie Soft Toy to giveaway. Disclosure: We received a Paddington Movie Soft Toy FOC for the purpose of review. Previous Post: « How to make every day a spa day – you deserve it! We’d take him on the ferry over to the Isle of Arran this Easter! Padfington would go on a trip to Cumbria, perfect backpack companion. I would take Paddington for a day out shopping! Then for a marmalade sandwich at the local cafe. We’d take him to Disneyland to meet Mickey. We’d take Paddington on holidays with us!! We would have a lovely picnic with cake and marmalade sandwiches. 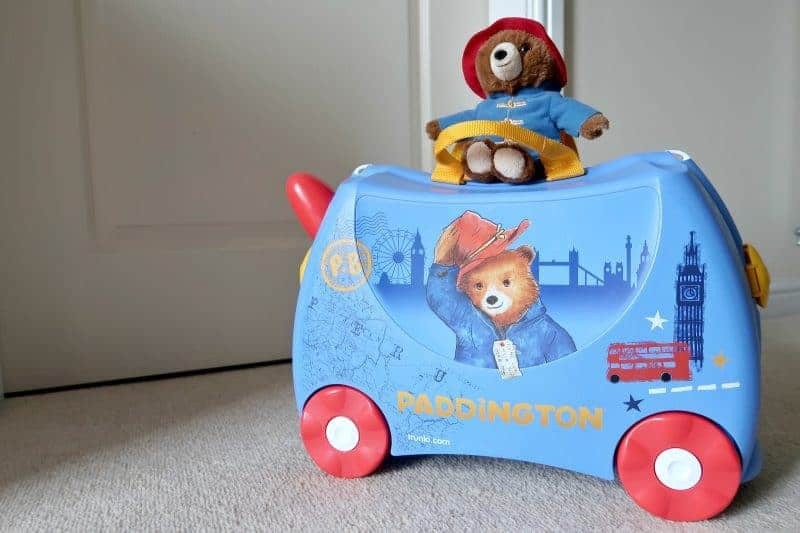 I would let my grandson take Paddington on holiday with him. My little boy would love taking Paddington out on out trips! Paddington would go on lots of adventures in our local woodlands with our family and dog! We’d take Paddington to London of course! And get up to lots of mischief! My two year old Granddaughter, Hazel and I would cook a cake for Paddington and then take him on a nature walk spotting and naming things on the way , ending with a picnic on the beach. Paddington would definitely be joining us on our annual trip to the seaside. I would take him painted rock hunting. See if we could find one with Paddington on. We would go to unusual places such as Pitcairn Island and Papua New Guinea. I think we would take Paddington to the local park. We would all go to the seaside in summer….. I would love Paddington to greet my little granddaughter when she travels down this June on the train with her parents to stay with me and then he can enjoy a train ride back to her house when they go back home. Paddington would most certainly live at the park and get pushd around in a bright pink pram if he lived with us..
A trip to Spain With me. An adventure to see wild animals. We would definitely take him camping! We would visit Wales and have a wonderful train journey! we would love to take him camping! We’d take him on our family holiday to France. He’d be off to Connecticut in a few months to visit my sister and brother-in-law and then nearer Christmas he would be off to Florida for another holiday. Plus any day trips inbetween to the coast where he could have an ice cream and a ride on a donkey. On a picnic in the forest. We would take him on holiday with us so that he could have adventures abroad as well. I would take him with the kids to Disney World! I think he’d enjoy water skiing at the Lake District. Paddington would come shopping with us, to grandma’s house with us, pretty much everywhere with us! Enjoying the great outdoors :- Trip to the seaside.